Be the smartest guy at the water cooler. Can you tell the I.D. of a Bearing by the part number? Example: 62"04" x 5 = 20 mm I.D. 72"05" x 5 = 25 mm I.D. 53"06" x 5 = 30 mm I.D. 13"07" x 5 = 35 mm I.D. 222"08" x 5 = 40 mm I.D. 64"10" x 5 = 50 mm I.D. Memorize the first 4 sizes and you can be the smartest guy around the water cooler! What is the difference between and "SD" and an "SDS" Q.D. Bushing? Frankie, good question! The difference between the two is that an "SDS" is nothing more than a short "SD". i.e. : length thru the bore. In a pinch, you can substitute one for the other. Example: SD x 1" and SDS x 1"
What does Q.D. Bushing stand for? Someone told me that it is wrong to use Anti-Seez compounds on Q.D. Bushings. True or False? Frankie, that is an absolute truth. Never use Anti-Seez on Split Tapered Bushings. 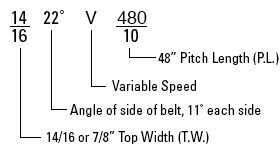 Is it possible to tell the length and top width of a v-belt by its part#? How can you tell top width and length on A, B, C, D & E V-Belts? B60 = 5⁄8 T.W. and 60" I.C. C60 = 7⁄8 T.W. and 60" I.C. A - 60 + 2" = 1⁄2" T.W. x 62" O.C. B - 70 + 3" = 5⁄8" T.W. x 73" O.C. C - 100 + 4"= 7⁄8" T.W. x 104" O.C. D - 210 + 5"= 1 1⁄4" T.W. x 215" O.C. E - 144 + 6" = 1 1⁄2" T.W. x 150" O.C. How about the variable speed belt part numbers? Frankie, that's a simple one. Do A.N.S.I. standard roller chain part numbers stand for anything? Simply take the first # in the case of a two digit part#, or the first two #s in the case of a 3 digit part #, put it over 8 and it will provide you with the pitch or pin to pin measurement. The above is a rule of thumb and does not tell all. Can a shaft size be determined by looking at a C/R oil seal part #? Absolutely! For example: 17284 C/R would have a nominal shaft size of 1.7" derived from the first two digits. Do NEMA motor numbers mean anything? What does A.G.M.A. stand for? When they say A.B.E.C. 3, 5, 7, 9, what does that mean? Annular Bearing Engineering Committee, which dictates as to the quality of the precision of class 3, 5, 7, 9; 9 being the top quality of a given bearing. On a worm drive, which is the worm and which is the worm wheel? A Timing Belt number of, for example 700H150 means what? So, what does XL, L, H, XH, XXH tell us about timing belts? Can you tell the outside diameter of a sheave by the part #? Yes and no. If the part # is that of a Hi-Cap type as in 3V, 5V & 8V belts, yes. On a worm gear drive, which gear is steel vs. bronze? The worm is always steel and the worm wheel is bronze. I see F.H.P. on some belts. What does it stand for? Well Frankie, that is a designation for Fractional Horse Power. Those belts are designed for below 1 H.P. Example: 1⁄2 H.P., 3⁄4 H.P., 1⁄3 H.P., etc. Why do some V-belts have cogs on the inside? Great question! Contrary to popular belief, it is not for grip. They are designed for heat dissipation and minimal pulley wrap or the ability to go around a smaller pulley than the same belt without cogs. Think of it as your finger when you straighten then close. Who knows what P.D. stands for? Francis, P.D. means Pitch Diameter on a sheave. Do timing belts go by any other names? Why, yes they do. Timing belts are also referred to as positive drive belts because they have positive engagement, i.e. teeth to teeth like chain and sprockets. Another fancy name would be synchronous drive belts because they don't slip like v-belts and they allow for a synchronized drive. Example: A printing application where print needs to repeat and not wander down the page. I recently put a set of 4 B-90 v-belts on a sheave and lined up all the part numbers. In other words, B-90/B-90/B-90/B-90 straight across. I tensioned them as prescribed, turned the drive on and then turned it off. I was shocked to see that the labels no longer lined up. Why? Excellent question! Simple answer: v-belts are designed to slip a little on startup so as not to break by attempting to transmit all the horsepower all at once. Double pitch roller chain has a pitch twice that of corresponding ANSI single-pitch chain. Example:	Double pitch roller chain #. Drive Series - add 2000 to the base ANSI standard number. When they say Drive Series vs/ Conveyor Series in roller chain, what is the difference? Frankie should know this, but is a little confused by the word "Pitch". Pitch is talked about in different products. What does "Pitch" mean? Generally speaking, "Pitch" means the center of one thing to the center of the next. From the center of one pin to the center of the next pin. Timing Belts = center of one tooth to the center of the next tooth. 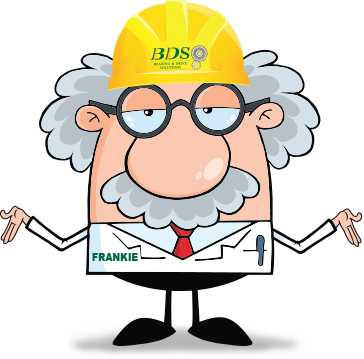 HTD Belts = center of one tooth to the center of the next tooth. Select a question from the list and I'll give you the answer!